This article from the N.Y. Times talks about a possible source for intelligence services to get a foreign spy on their side. Sadly, as it turned out, the spy was a double agent and detonated a vest bomb while speaking to the C.I.A. officials. Seven people were killed. A crucial loss for the C.I.A. I don’t have much to say about this. The article itself is logically structured. The most important facts or implications are suggested in the lead, respectively the following grafs. I love how the NY-Times just basically “mocks” the C.I.A. for being so careless. Some people might not be able to read between the lines, but this is one example or how the media can and will expose federal agencies. “Resisting punishing people for mistakes?” WHAT THE HELL!!! SEVEN people died!! Get the loser who caused this trouble out of there. Clearly, in a world of emerging technological experts, it shouldn’t be tough to replace a guy or find the mistake and take care of it. I have my own agenda on secret agencies. I can’t stand the idea of them not being punished because all their crap is “underground”. Screw that!! This tabloid article from The Sun (British magazine) tries to make a story out of a couple suicidal incidents at the same school in Trowbridge, UK. The victims are 13, 15, and lastly 19 years old. The question is whether the three cases somehow relate to one another. At least, that is what the lead suggests. I chose the first best article I could find on a tabloid’s website. I came in with the typical notion that those magazines are, by no means, newsworthy publishers. This story might be fun and interesting to investigate. But it mainly talks about close family and friends and how they utter their condolences, compassion, and memories of the victims. There is no structure in the story. The lead does not relate to the content. Quotes are randomly put in. I had trouble making sense of most the information, as it wasn’t an easy, enjoyable read. Maybe, that is partly due to the single sentences that are presented, instead of comprehensive grafs. I know, what could I have expected from this? But seriously! Starting out a story of dead girls with the word “attractive”, or captioning pictures with “loss” or “devastating”… that shows few respect, and doesn’t really create something newsworthy and compelling to the reader. But maybe that’s exactly what the readers of The Sun want. I love the little note on the bottom that provides a hotline for Samaritans, in case of “needy readers”. Governor Terri Branstad presented himself in a jolly demeanor on Morningside’s Campus last Monday. He strongly asserted his capabilities to get Iowa back on the rise. During the Q-&-A part of the discussion, Branstad expressed how much he loved Iowa, running for governance not for the money but because he feels capable of redirecting Iowa out of its mess. Issues being raised during his presentation were health care, the retention of judges, private and public education, tax regulations, and unemployment. Branstad seems to have a plan for Iowa’s future. Right now, according to recent polls, his support numbers are around the 55%-mark. He is favored by 90% of Republicans in the state. Elections are held on November 2nd. Last year, students rarely made visual contact with the white little paper bags, also known as sacked lunches. This year, the new design and structure of the program earn respect through a significant rise in supply numbers. A sacked lunch consists of four items: a sandwich, a drink, and two additional sides. Sides for example are chips, yogurt, bananas or apples, cookies, carrots, hard-boiled eggs, and candy bars. The white paper bags count towards the meal plan and can substitute any meal of the day. Most notably new to the sacked lunched program are the variety of sandwiches and the urge of Sodexo to steadily increase the students’ level of satisfaction by receiving feedback and suggestions. Also, the face of the program has changed. Last year, the program was situated downstairs in the Olsen Student Center and incorporated in the Buck’s Snack Bar. Now, students can find at a much more convenient location: right next to the registers of the main dining room. “We ordered the equipment over the summer, and installed two registers for convenience,” said Karla Ruby about the origins of the new program. Karla Ruby is the food coordinator on campus. She has been with the main food provider Sodexo for 11 years and does promotions, works in the marketing field, and handles student interactions. Last year, when they started the sacked lunch program the first semester of 2009, students spent all their Buck’s money too quickly (a certain amount of money included in one’s choice of meal plan). Plus the sacked lunch program was much less visual and appealing, as no one could see all of his or her options at once. “We revamped the program, so people get full. And we also make sure there are healthy choices, vegetarian stuff like carrots, eggs, and salads,” Ruby explains. This semester, they give out about 120 sacked lunches a day, which is quite a turnout for a small campus. Her dad, Les King, works up at one of the registers. It is his third year with the company. He said one day they gave out 150 white paper bags, one of “the highest numbers he’s ever seen”. He explained that last year, the managers were happy when they distributed around 500 a week. This year, the goal is at a minimum of 600, aiming to exceed the 700-mark as the school year progresses. “I think this program is good for athletes and for people who try to get something quick. Plus, we try to change up the choice of sandwich from time to time,” so King. He also says he has spotted some loyal customers to the program. When students make requests and are heard, they return. In general, students use the program because they often are in a hurry. Athletes need to get to their night classes after practice, and sometimes just do not have time to eat a full meal. From observation, it looks as if girls comprise the majority of customers. There is not a lot of critique on the white paper bags, mainly due to the students’ individual choice. Junior Kyle Bubb indicates, “I wouldn’t miss anything at the cafe. Even though there is less variety, I know what I’m getting.” He admits one would get more out of the main meal, but some people just do not have time. “Schedules are pretty busy for a lot of people,” Bubb said. After talking to some more students, it became clear they like what they have. But they would not mind improvements. Bubb thinks one should be able to purchase portion amounts, and then equivalently would get charged more or less. With the numbers of customers staying consistent, one will see if and how improvements can be implemented. Nonetheless, the “whites” are indeed popular, and signify a hint for extension to campus food services. In this PO (piece of opinion), Thomas Friedman zooms in on the environmental issues in California. Two big time oil companies want to repeal the global warming preservation program (A.B.32), their argument being it doesn’t create as many job opportunities as it ought to. Employment is very appealing to Californians, so the key right now is to convince the people that big oil companies don’t care about public interest. I thought it would be a good change up to look at a piece of writing that is written by an experienced blogger. So I looked in the green zone of the N.Y. Times. I generally like how bloggers make their first statement. Here, Friedman talks straight to the reader. That draws attention. He then goes on to present the facts of the debate or discussion he is raising. Quotes follow, until he gets to the bigger picture, which in this case is a national concern (possibly international). The style here might be an upside-down cocktail glass. It starts with a kicker, and then presents some basics. Finally, the issues are discussed through citation. The reference to Mother Nature, and possibly climate implications, and interest conflicts, are the tip of the cup. Almost like the last straw. About 30 years ago, a man raped and killed a teenage girl. He was sentenced to life with option to parole. He was supposed to receive lethal injection early this week, but due to some newly adopted procedures, a federal judge halted the process. On Friday, the lethal medicine expires, leaving the murderer another year to “enjoy” prison life, because back-orders cannot me made until 2011. When I first read this article, the story was put on Breaking News Alert. Today I found out it actually received an up-date. Yesterday, there was a lot of mixture in the story, different focuses and no real structure and point to get to. Now, things have changed. The lead is informative, not really appealing, but considering the topic of this story that seems all right. However, the point made about the expiration of the drug doesn’t have as much weight in the story and is never mentioned again. Towards the end of the story, the focus shifts to other examples of execution setbacks. So, I guess the story does los its focus at some time. Nevertheless, the author(s) draw several sources into their story, among them Schwarzenegger and a statement of the murdered girl’s sister on the justice of the whole case. All in all a good coverage. I liked the picture of the condemned to somewhat manipulate the feelings towards sadness and compassion of the reader. … at least when you’re looking for one that’s not beige or similarly colored. “Oh nooo! Let me look in my supplies.” Mary Krejci said to me on a rather chilly, but despite sunny Monday afternoon. I needed to find a “not-beige” rubber band. Turns out, those things like to hide in but a few spots in admission offices. On my walk over to Lewis Hall, I had company from Reid and Grace, and for some reason we came to talk about shopping and clothes. If men take as much time to make up their minds about a particular item – or more. The squirell along the sidewalk distracted me from the conversation. I always space off looking at those little, cute but evil-minded creatures. I went straight to the admissions office, figuring they would have what i was looking for. My instinct guided me to Mary Krejci, a lady past her mid-life crisis, with blonde-greyish hair, and glasses that amplify her friendliness. Even though i just asked for a little rubber band, she jumped right up and scrambled around her office. “Look, does this work?” She held up a blue rubber band, snatched from some desk around the corner down the hallway. I said that would be fine, thinking about how this somewhat stressful search resembled my frustration going into this week. I wanted to listen and share my own thoughts about stress and privacy, but i had to get back to share my experiences with the visitor’s of this nest. It’s nice to know she wanted to keep talking, and i surely am grateful for the little, blue rubber band, which in the end, made all this possible. Subtleties are not so much subtle after all. 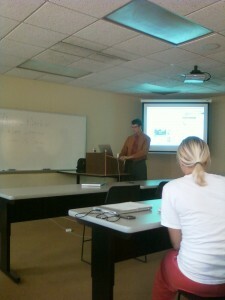 Sioux City Journal’s Online Director talked in a Mass Comm class last Wednesday. The news world is changing, at a fast pace. Instant videos and online expansion are the means of future journalism. and extension possiblities to stories by plain video inputs. on other’s comments, and interact through their own “news contributions”. change, and even bloggers are considered journalists today, we will rely more on “somebody out there” who will gather information for us, which then would mean that, indeed, everybody can produce news. The path of modern news is somewhat blurry, but the direction is clear: quick, online, interactive. A notion that most old-dog newspaper editors probably regret.